Home » Auto News, News » What’s it going to take to make it click? Always #MakeItClick before driving or riding in a vehicle. When you #BuckleUp, make sure the lap belt sits across your hips and the shoulder belt fits over the middle of your shoulder and across your chest (don’t reposition the shoulder belt behind you or under your arm). Don’t let children 12 or under sit in the front seat of a vehicle. Ensure your child is in the correct car seat. Visit an SGI car seat clinic or book an appointment with a car seat technician. Put blankets and coats over child seat straps – remember, the fit should be snug; you should be able to fit only one finger between the harness straps and the child’s chest. As you saw above, the February Traffic Safety Spotlight is on occupant restraints – seatbelts and car seats. 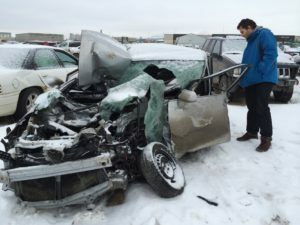 But this is more than just a news release: Josh Campbell of Regina believes he is alive today because of a seatbelt. Josh believes he would have been ejected from the vehicle and killed if he wasn’t wearing his seatbelt. Despite the curtain airbag, his head struck the side window with enough force to smash it. Because he was wearing his seatbelt, he emerged with only a sprained ankle and some glass in his ear. Josh is someone who can tell you, firsthand, how seatbelts save lives. So #MakeItClick!